Rhinoplasty and septoplasty are both nasal procedures, but there are notable differences between them. To better understand rhinoplasty and septoplasty procedures, let’s take a look at each type of surgery, how it is performed and each treatment’s benefits. A rhinoplasty, commonly referred to as a nose job, is a popular cosmetic surgery. It enables a patient to improve facial harmony and treat functional issues of the nose. For some individuals, the nose appears out of proportion relative to other facial features. In these instances, the nose detracts from a person’s overall facial appearance. But with a rhinoplasty procedure, an individual can bolster facial symmetry and improve the shape of the nose, resulting in an enhanced facial appearance. Nose surgery also allows an individual to treat a bulbous nasal tip, bump on the bridge of the nose and other nasal issues. Nose surgery may be performed on individuals dealing with functional problems, too. For example, rhinoplasty surgery sometimes helps correct breathing issues associated with the nose. Teenage Rhinoplasty: Addresses cosmetic or structural issues of the nose and is available to teenage patients. Teen rhinoplasty surgery may be completed on boys as early as 16 or 17 years old and on girls as early as 15 or 16 years old. Male Rhinoplasty: Reshapes the nose and corrects structural defects of the nose. Male rhinoplasty is tailored exclusively to men and ensures a man’s nose naturally complements his other facial features. Ethnic Rhinoplasty: Accounts for the unique facial characteristics of patients from different ethnic backgrounds. An ethnic rhinoplasty surgery enables a patient to treat nasal issues and improve his or her facial appearance; at the same time, the procedure won’t require a patient to sacrifice his or her distinct ethnic facial features. An expert facial plastic and reconstructive surgeon first meets with a patient to determine if he or she is a good candidate for rhinoplasty surgery. Next, the surgeon crafts a custom rhinoplasty treatment plan for this individual. The surgeon then explains his or her rhinoplasty treatment plan to a patient. He or she also encourages a patient to ask rhinoplasty surgery questions and learn about all aspects of treatment. A septoplasty is a nasal reconstruction procedure used to straighten or remove a portion of a deviated septum. If the nasal septum is damaged, an individual may suffer a nasal blockage. In this instance, an individual may experience headaches, sleep apnea, difficulty breathing and other health problems. Thanks to a septoplasty, this individual can correct his or her deviated septum and address these health issues. Septoplasty and rhinoplasty surgeries are not interchangeable. To determine which procedure is the best option, an individual must consult with a facial plastic and reconstructive surgeon. 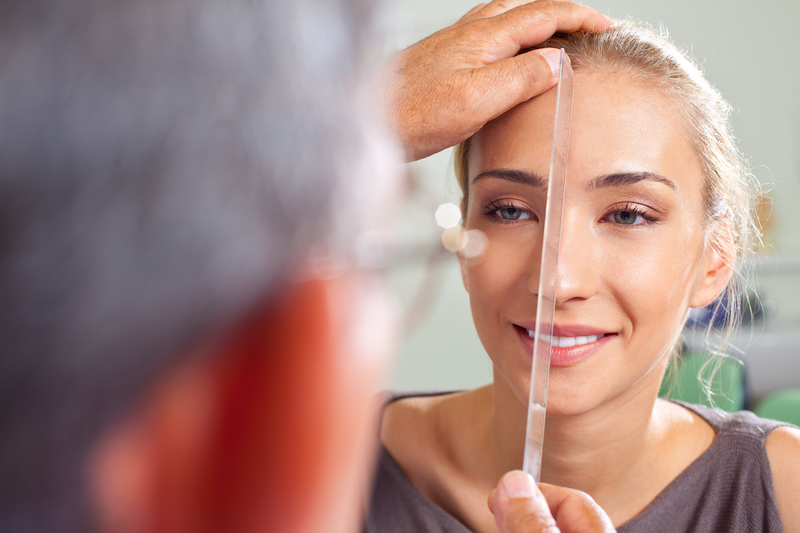 During a consultation, a facial plastic and reconstructive surgeon evaluates a patient and his or her treatment goals. The surgeon also reviews a patient’s medical history to identify any potential septoplasty or rhinoplasty surgery risks. Following a consultation, a facial plastic and reconstructive surgeon offers an informed treatment recommendation. He or she may recommend a rhinoplasty or septoplasty. In some cases, a facial plastic and reconstructive surgeon may recommend both procedures be performed at the same time. Together, septoplasty and rhinoplasty surgeries are sometimes used to treat a deviated septum and enhance the appearance of the nose. The procedures enable a patient to simultaneously address breathing issues associated with a deviated septum, as well as revitalize his or her facial appearance. How Does Dr. Azizzadeh Approach Rhinoplasty and Septoplasty Surgeries? Dr. Babak Azizzadeh is a Harvard-trained and globally recognized facial plastic and reconstructive surgeon. He takes a holistic approach to rhinoplasty and septoplasty surgeries, and in doing so, helps his patients achieve the best-possible results. Each rhinoplasty and septoplasty patient is different, and Dr. Azizzadeh works closely with his patients to craft their treatment plans accordingly. Dr. Azizzadeh learns about a patient and finds out why this individual is considering a rhinoplasty or septoplasty procedure. He sometimes recommends rhinoplasty or septoplasty surgery – or both – and teaches his patients about the treatment process. Plus, Dr. Azizzadeh prioritizes long-term results, and he collaborates with his patients to help them accomplish their desired rhinoplasty or septoplasty treatment goals. Dr. Azizzadeh is happy to meet with a patient and provide insights into rhinoplasty and septoplasty surgeries and other facial plastic and reconstructive procedures. To schedule a treatment consultation with Dr. Azizzadeh, please contact us today at 424-512-1617.